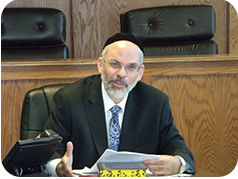 Rav Yona Reiss, Av Beis Din cRc, holds a shiur for kashrus rabbonim, kashrus staff and chaverim every other month. It is best to call prior to the next shiur to confirm the date and time. Mon-Thurs from 5:00 p.m. - 5:30 p.m.